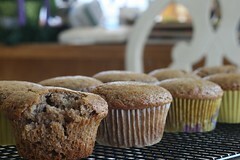 These muffins are hot items in my house for my girls how still eat whole grains. 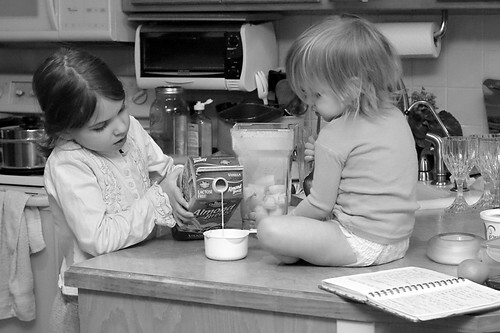 I make this recipe frequently for them. The original recipe came from Sue Gregg. I've modified it to meet our needs and tastes. You just need a good blender, some whole grain (NOT flour, but the actual wheat berries - the real shebang) and some patience because this is a soaked grain recipe. Soaking grains unlocks all the good things stored inside and prepares the grain for easy digestion. The only thing better would be sprouted grain, and well, that just takes more time. Soaking is easy, though. Add all of that into your blender in the order listed. Cover and blend for 2 minutes. I start mine off slow, then work it up to a nice high speed for the last minute. Now walk away and let that baby sit overnight right there on the counter about 12 hours. While you are snoozing, the vinegar and honey is going to work it's magic on that grain. 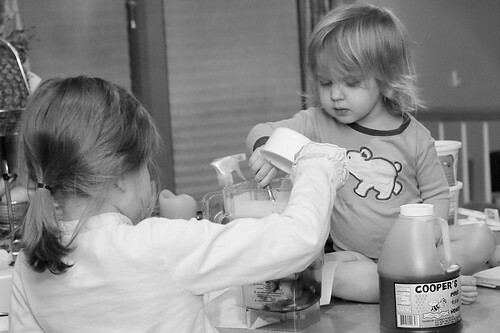 In the morning (or 12 hours later) add in one large egg and pulse your blender to work it in. Then add 1/2 teaspoon salt, 1/2 teaspoon baking soda, and 1 1/2 teaspoon baking powder. Blend to incorporate. Fold in your chocolate chips (we like Enjoy Life allergen free) and pour into your lightly greased muffin cups. Bake at 350 degrees for about 20 minutes or until done. I usually get 12 to 18 muffins, although I often bake it in a 9x13 pan or in a couple loaf pans. Adjust the baking time according to your pan. I've also made these as plain banana muffins and I've made these as spice muffins. These are plenty sweet enough without the chocolate chips. For the spice muffins, increase the cinnamon to 1/2 to 3/4 teaspoon and shave up to 1/4 of a nutmeg into the batter. Yes, you can use ground nutmeg. But let me say that once you try fresh ground nutmeg, you will never go back to those little shaker bottles in the spice aisle. It's just not the same. Hi Rae! I have a BlendTec. It was by birthday present last year and I love it! Cool. I'm weirdly blender obsessed lately, LOL! I have a batch of these in the oven right now. :) Thanks so much for posting the recipe! Oh. my. gosh. These muffins ROCK! Yum. Definitely going to be a staple around here. if i use cows milk do I put this in the fridge? thanks! Nope. Not according to Sally Fallon in Nourishing Traditions. The vinegar will help ferment the milk and the grains and prevent the growth of bacteria. Rae. So glad you love them! They are a staple around here for my wheat tolerant kids and I almost always make these for breakfast when we have guests.